Figure A91. Wichita anomaly, interpreted as the Wichita slab, with (horizontal) [vertical] cross sections through (A)[D] the UUP07 p-wave) and (B)[D] the combined SL2013 and S40RTS s-wave models at 2390 km; C) the location of the modern geological record that we interpret to have formed during the subduction of the slab. 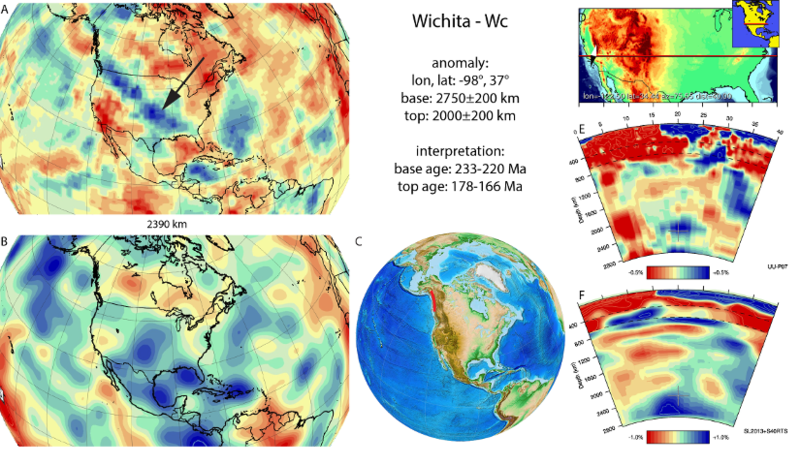 The Wichita anomaly (Figure A91) is located below central North America from the core-mantle boundary up to deep mantle. It was first described in van der Meer et al. (2010), where we interpreted the anomaly as the Wichita slab that is the result of intra-oceanic subduction consuming Panthalassa lithosphere, creating the Mesozoic part of the intra-oceanic Paleozoic-Mesozoic Stikinia-Quesnellia arc. This arc consists of an extensive suite of mainly Late Triassic and Early Jurassic volcanic and granitic plutonic rocks, each extending for a distance of about 1,200 km (Nokleberg et al., 2000). Based on the long extent, another part of this arc is perhaps associated with the Trans-Americas slab). Van der Meer et al. (2012) highlighted this slab as effectively forming the separation between the Slide Mountain and Thalassa Oceans. The interpretation of this deep slab and the Trans Americas slab was to some extent corroborated by the plate model of Shephard et al. (2013), who also identified material lying along the core-mantle boundary at these locations using six tomographic models. They tentatively suggested that the Wichita slab could represent Cache Creek Ocean and/or Farallon lithosphere that subducted along the Talkeetna– Bonanza and Gravina arcs, or alternatively an older remnant of Slide Mountain Ocean lithosphere subducted below earlier Stikinia-Quesnellia arcs. Johnston and Borel (2007) interpreted a two-stage process, a first involving intra-oceanic subduction and arc formation and accretion forming Stikinia-Quesnellia between 230 Ma to 150 Ma within the (eastern) Panthalassa. In a second stage, from 150 Ma to 55 Ma, this arc migrated towards North America, collided, and moved northward parallel to the continental margin. We correlate stage one with the Wichita slab and stage two with subduction leading to the Hudson slab. Barresi et al. (2015) analysed the lower Hazelton Group in central Stikinia, which comprises three volcanic-intrusive complexes that nconstitute almost 16 km of volcanic stratigraphy. U–Pb zircon ages indicate that volcanism initiated by ca. 204 Ma (latest Triassic). Detrital zircon populations from the basal conglomerate contain abundant 205–233 Ma zircons, derived from regional unroofing of older Triassic intrusions. They also linked the spatial co-occurrence of Hazelton Group volcanic rocks with a belt of economic Cu–Au porphyry deposits (ca. 205–195 Ma) throughout northwestern Stikinia. Strata in the upper Hazelton Group) with a U–Pb zircon age of 178.90 ± 0.28 Ma represent waning island-arc volcanism. Milidragovic et al. (2016) incorporated the above results and included the absolute dating of the Hickman (222-220 Ma) and Three Sisters plutons (172 +/- 6 Ma) and as the first and final evidence of volcanism in the Mesozoic Stikinia terrane. Based on these studies above, we adopt a 233-220 Ma start of subduction and 178-166 Ma as the end defining the ages of the base and top of the Wichita slab respectively.